HIT THE DECK - Anchors Aweigh. On the Town, Hit the Deck. Hollywood has always known what to do with sailors on leave: Give ’em some pretty girls and some great songs and watch the fans line up to enlist! Hit the Deck hits all the right notes as three sailors (Tony Martin, Vic Damone, Russ Tamblyn) and three cuties (Jane Powell, Debbie Reynolds, Ann Miller) flirt, squabble, run afoul of shore patrol and of course, fall in love to a hit parade of Vincent Youmans tunes. Highlights include Miller’s polishing the floor as The Lady from the Bayou, Martin’s romantic mastery of More Than You Know and the stage-filling rouser Hallelujah. Music, romance, fun: don’t miss the boat! DEEP IN MY HEART - That Kelly lad sure can dance. Fred Kelly. In his only credited film role, he and legendary brother Gene happily hoof a I Love to Go Swimmin’ with Wimmen specialty romp in this colorful musical biopic about Sigmund Romberg, the ex-piano man who went on to compose some 80 productions. There’s much more to love, too. Ann Miller gams and glams It (from The Desert Song). Jane Powell and Vic Damone remember Will You Remember (Maytime). Jose Ferrer (as Romberg) demos all the roles of a gleeful Jazza-Doo spree. And before Deep in My Heart is sung, danced and jazza-done, you’ll find Cyd Charisse, Merle Oberon, Howard Keel and more. The talent runs deep. So does the fun. KISMET - With Alexander Borodin’s soaring music fashioned by Robert Wright and George Forrest into Stranger in Paradise, Baubles, Bangles and Beads and more evergreens, Kismet turned the Broadway stage into a glittering, gleaming Arabian Nights’ dream. And this was ideal material for the dream factory. To Hollywood and director Vincente Minnelli, Kismett was kismet. This lavish musical follows one fateful, fabulous day as a beggar-poet (Howard Keel) and his daughter (Ann Blyth) cross paths with a wicked wazir, a wily temptress, a handsome prince, a magical curse, opulent sets and exotic adventure. “Princes come, princes go,” sings the beggar. Glorious Kismet endures! NANCY GOES TO RIO/TWO WEEKS WITH LOVE – Yes, Nancy Goes to Rio – and fun comes along! A colorful backlot Rio is the setting for a comic tale of personal and professional mixups as aspiring actress Nancy (Jane Powell) and her Broadway-veteran mother (Ann Sothern) seek the same stage role. Adding to the Brazilian flair: Carmen Miranda in zany-hatted performance glory. Powell’s sunny charm and bright soprano are again on display when she and Debbie Reynolds turn a 1900s Catskills vacation into Two Weeks – with Love. Powell hopes to catch the eye of suave Ricardo Montalban by wearing a form-fitting undergarment: a (shhh!) corset. Reynolds reels in affable Carleton Carpenter for a legendary Aba Daba Honeymoon showstopper. Speaking of legends, Busby Berkeley provides the musical staging. 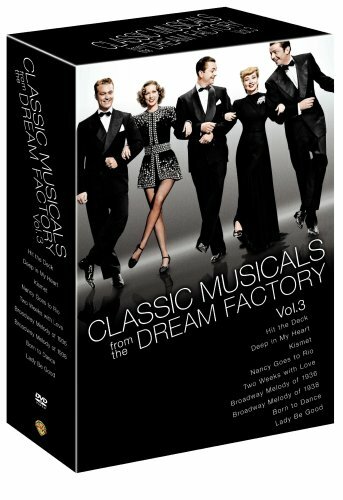 BROADWAY MELODY OF 1936/BROADWAY MELODY OF 1938 – There’s no stopping them now. Eleanor Powell taps the spangled ebullience of Broadway Rhythm in Broadway Melody of 1936, 15-year-old Judy Garland sings a smitten Dear Mr. Gable to a portrait of Hollywood’s King in Broadway Melody of 1938 and both actresses notch out career breakthroughs. Powell plays an Albany girl-next-door who poses as France’s and Broadway’s exotic La Belle Arlette in the Oscar®-winning* ’36 romp. The ’38 tale has her portraying a horse trainer who’s just as much at ease in taps and tuxedo as she is in riding boots and jodhpurs. Judy steps lively, too, joining Buddy Ebsen for Everybody Sing. Everybody enjoy. These star-making Melodies are playing every classic fan’s song. BORN TO DANCE/LADY BE GOOD - Eleanor Powell’s the girl, James Stewart’s the gob and Cole Porter’s the tunesmith in Born to Dance, a break-a-leg tale of an understudy turned Broadway star that includes Powell taking command of a battleship for Swingin’ the Jinx Away. Her radiant appeal and astonishing tap-dancing skills energize the screen again when she plays friend and matchmaker to two struggling songwriters (Robert Young, Ann Sothern) in Lady Be Good. Highlights include Powell’s astonishing Fascinating Rhythm hoofing and Sothern’s poignant rendition of the World War II evergreen and Oscar®-winning* Best Song The Last Time I Saw Paris.